The world’s best-selling boy band Backstreet Boys returns to Singapore this October as part of the entertainment line-up at the WTA (Women Tennis Association) Finals tennis tournament. This will be the only country in the region they will perform in, as well as the first international extension of their Las Vegas residency show. 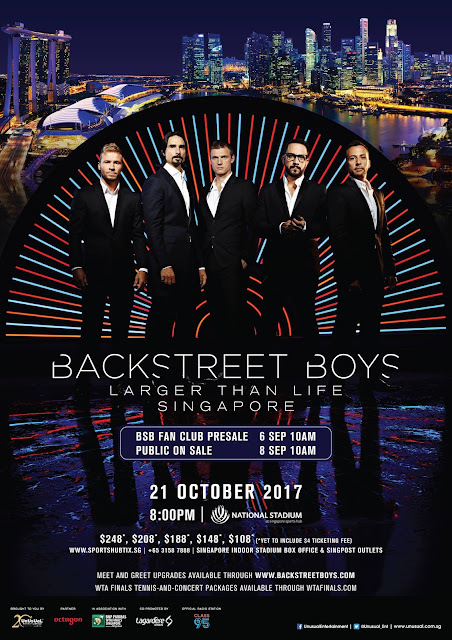 The concert, entitled “Backstreet Boys: Larger than Life Singapore” will take place on 21 October 2017 at National Stadium. Presented by Unusual Entertainment, Backstreet Boys last performed in Singapore in 2015. Tickets are priced at SGD108, SGD148, SGD188, SGD208, and SGD248. Fan club pre-sale tickets go on sale on 6 September at 10am, while public sales begin on 8 September at 10am, via sportshubtix.sg. With a career spanning over two decades, Backstreet Boys have sold over 130 million records worldwide with hit songs like “I Want in that Way”, “Everybody”, “As Long as You Love Me”, “Shape of My Heart”, “Larger than Life”, and more.